The first reading for eminent domain against the Union Dry Dock in uptown Hoboken passed easily 8-1 Wednesday night. The next and critical second reading will not be held as typically anticipated in two weeks but on November 13th - after Hoboken's heavily contested mayoral election. The vote as it turns out was anti-climatic. All of the candidates running this election cycle voted on first reading for approval: City Council President Jen Giattino and council members Ravi Bhalla, Mike DeFusco, Dave Mello and Jim Doyle. The vote however was preceded with less than the usual official reading of the ordinance with no discussion. City Council President Jen Giattino announced if the ordinance passed it would be scheduled for November 13th after the election. She said it was to remove the politics from the matter with the upcoming Hoboken mayoral election. Councilman Ravi Bhalla immediately took issue strenuously seeking to keep the issue alive before the November 7th mayoral election. Were Bhalla campaign mailers already printed or ready for printing? It sure had the sound of it. Not be left out, Councilman Mike Russo joined in along with Councilman Bhalla. He's backing Freeholder Stick Romano for mayor and said he would like to see the touchy eminent domain issue decided before the election to get mayoral rivals on the record. Pin those candidates down. Smooth. Lots of jibbing and jabbing and Jen Giattino casually mentioning she spoke to the mayor at 4:15 pm who said tabling the matter was not a problem. Ravi Bhalla chimed in repeatedly with "I'm not the mayor" and declared the eminent domain vote "urgent." It led to this revelatory exchange. Councilman Russo, "Who brought it before the council on an urgent matter?" Council President Jen Giattino, "Councilman Bhalla." Councilman Dave Mello politely interjects, "How do we assess the urgency?" Councilwoman Tiffanie Fisher would add, "because the mayor indicated it's not urgent but Councilman Bhalla has indicated it is urgent." Councilman Mike Russo took note of it all and then declared to no one in particular, "welcome to silly season." Some mini-chaos followed as a discussion on whether the City Council can delay the second reading with a vote prior to the actual vote on eminent domain itself. Corporation Counsel interjected with a bid to move the proceedings in the direction toward Ravi Bhalla's hopes and dreams. Wait, aren't campaign contributors conflicted from ruling on what benefits the beneficiary of their contribution? Brian, you are recused! 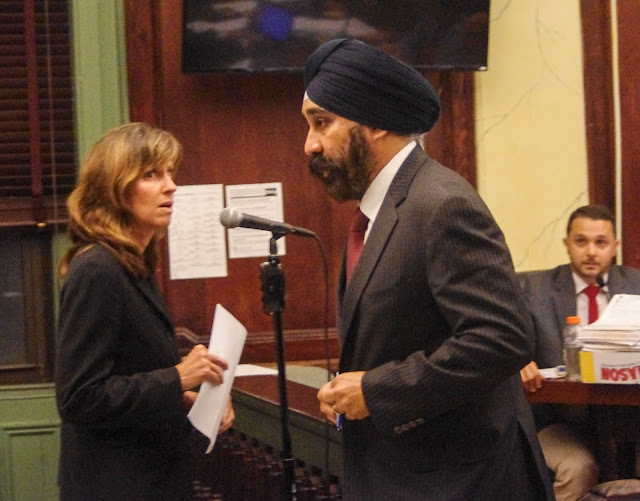 Bottom line, the resulting vote killed any chance of the second reading when public comment is available being heard before the Hoboken November 7th mayoral and council at large election. See everyone on the "urgent" matter of Union Dry Dock after the election - on November 13th. City Council President Jen Giattino. It didn't go according to plan. Talking Ed Note: The public doesn't even know what the urgency was to call for eminent domain on the only waterfront business operating in Hoboken. Maybe there's a potential buyer and Hoboken wants to get in on the action. Who knows? Not us, the Hoboken public. Based on the urgency being declared by Councilman Ravi Bhalla, you could almost feel and hear the desperation of him all but saying, "I need this for my election campaign." As an aside, the Corporation Counsel should brush up on the Robert's Rules of Order. A point of order is not recognized for a council member to say as stated, "We should hear this at the next council meeting." That is not a point of order. A point of order should not interrupt a vote in progress either as Councilman Bhalla did asking for the vote on eminent domain's second reading be held after the vote on the substance of the ordinance. The posturing was clearly not about the "urgency" and all about the Bhalla campaign. The Bhalla braintrust may need to revisit a planned/printed campaign mailer. The intention of all this skullduggery wasn't Reform, good governance or transparency. This was intended to pin down his rival City Council President Jen Giattino before the Hoboken's mayoral election next month. Video coming will make this more obvious. Transparently.